Older content! The beer bike's route has been limited by the government. Please inquire about the new route in email. If you come to Budapest, you’ve probably already seen some pictures of Heroes’ Square, the monument that is a symbol of the city. 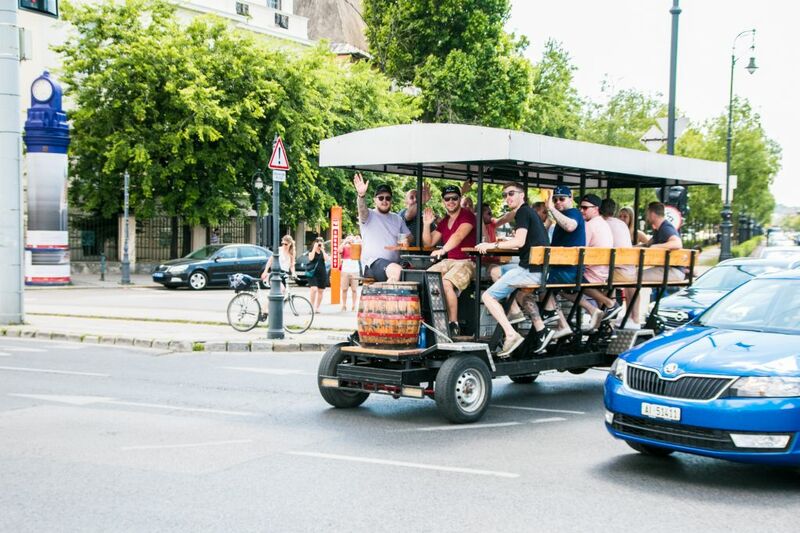 The Beer Bike Budapest trip begins right there, in the center of the city, next to the entrance of the beautiful city park, which is one of the first public parks in the world, with trees that are more than 250 years old! Quite a sight for a drink, eh? Get on the road with 4-16 of your buddies, and start drinking, listening to some of your favourite tunes on the built in stereo. Starting out from Heroes’ Square you will pass by some statues of our most important leaders and kings – have a cheers on their behalf! Next you will be rolling over the beautiful yellow bridge that holds two sides of the lake together. It’s a lake in the summer and an ice-skating court in the winter, a fascinating sight all year round. Next stop is the breathtaking architectural masterpiece, Vajdahunyad Castle. This stunning building incorporates all the historic architectural styles of Hungary, therefore it is a brief, but extensive summary of our history. The outside looks like a medieval castle, inside is a beautiful gothic rose window, a romantic renaissance balcony, a roman era chapel and a grand baroque palace. These will totally leave you in awe, with the help of the 30 liters of beer that is included in your beer bike trip. Oh and what’s more, there’s also a bust of Dracula in the castle, how cool is that? After the castle you can also pedal towards Széchenyi bath, that is our oldest and prettiest bath house of all. Although they have some great pools, you probably will be swimming in beer by now.